Hi, my name is Keats and on January 21, 2008 I became the youngest person to climb to the top of Kilimanjaro in Tanzania Africa. I was 7-years old. I climbed in brutal conditions, 30-below weather, freezing rain, sleet and snowto raise money for two of my favorite charities, The Jane Goodall Institute and Kids of Kilimanjaro. At 19,340' Kilimanjaro is the highest mountain in Africa and one of the highest volcanoes in the world. Kilimanjaro rises from the African plains, making it the highest free-standing peak in the world. Keats Kilimanjaro News 1 from Climb A Volcano on Vimeo. Keats Kilimanjaro News 2 from Climb A Volcano on Vimeo. I am climbing to benefit Kids of Kilimanjaro, they feed hungry children at 16 pre-primary schools lunch each day. 100% of the money they receive goes to feeding kids, there are no salaries paid to anyone at the charity or at its NGO affiliate. It costs just 20¢ (twenty-cents) to provide the only meal many of these children eat. Because of the success of Kids of Kilimanjaro, the drop-out rate has all but disappeared and the Tanzanian government is opening 15 new schools to accommodate the increased demand. Keats with Kids of Kilimanjaro from Climb A Volcano on Vimeo. 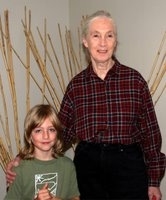 I am also raising money for The Jane Goodall Institute. Founded by renown primatologist Jane Goodall, JGI is a global nonprofit that empowers people to make a difference for all living things. They are creating healthy ecosystems, promoting sustainable livelihoods and nurturing new generations of committed, active citizens around the world. Keats on Kilimanjaro from Climb A Volcano on Vimeo. Just as Keats is getting help to raise funds for the organizations, he'll be climbing Kilimanjaro--step by step--alongside some expert Tanzanian guides and excellent porters from Thomson Safaris (www.thomsonsafaris.com), and they have been leading travelers in Tanzania for nearly 30 years! So we chose them to lead us to the roof top of Africa. traveling to a country where jobs are scarce and every dollar helps provide for a village. With over 20-years of experience in manufacturing travel clothing, ExOfficio knows how to create technical clothing for adventurers. Keats loves their Buzz Off technology which stops bugs cold. Keats' entire expedition team is outfitted in ExOfficio for a reason, we could have worn anything but we chose to wear ExOfficio because it rocks. Go buy some now. Supposedly their underwear is amazing - we'll update you later. PanasonicToughbooks are the ultimate laptops for adventurers or anyone working in extreme conditions. Panasonic kindly offered Keats the use of two CF-19 laptops for his expedition. Both are equipped with GPS and GSM capability and will allow him to communicate with the world on the mountain. He will also use them to conduct some basic science experiments for his school and he will use its built in digitizer to do his homework. These laptops operate in extreme temperatures, can withstand rain and snowstorms, they function at high altitude and have screens that are easy to read in full daylight. If we had the extra money we'd buy one. We're going to be sorry to see them go back.